Frankenweenie is a paradox for writer-director Tim Burton. Burton’s style has become a cage. His spirals, stripes, high-contrast colors, preference for Danny Elfman‘s scores, and reliance on Johnny Depp and Helena Bonham Carter made it seem like Burton had reached the limits of his creative powers. This limitation was highlighted by using it as a catch-all for any adaptation, and he’s only done adaptations since 2005’s Corpse Bride (and that was his only non-adaptation since 1990’s Edward Scissorhands). Strangely enough, by doing a stop-motion animated adaptation of Frankenweenie—based off his 1984 short film of the same name—Burton has come back to his origins in a way that hasn’t changed his style (although there’s no Depp or Carter), but rediscovered the fun and warmth that used to be intertwined into his visuals and tone. Victor Frankenstein (Charlie Tahan) is a science nerd with no friends except for his lovable dog Sparky. When Victor needs a permission slip signed in order to participate in the science fair, his father says Victor needs to compromise and also play baseball. Victor agrees, and at the game he hits a homerun, but Sparky chases after the ball, runs into traffic, and gets hit by a car. Sitting in science class, a depressed Victor learns that electricity might be able to raise the dead. He sets up a lab in the attic, harnesses the power of a lightning storm, and brings Sparky back to life. But then Victor’s treacherous classmate Edgar (Atticus Shaffer) learns about Sparky’s resurrection, the secret gets out, all the kids want to bring back their dead pets, and havoc breaks out. There’s a joy to Frankenweenie that’s been absent from Burton’s recent films. He can always get caught up in the visuals and some quirky ideas, but they’ve lacked a personal touch to the point where his recent movies could almost be an imitation of his earlier work. Frankenweenie returns Burton to his roots by bringing him back to the familiar neighborhoods inhabited with oddball characters who fear the abnormal even though they themselves are not bastions of normality. It’s the tug-of-war between the power of imagination, the fear of it, and somewhere in between finding something heartfelt. 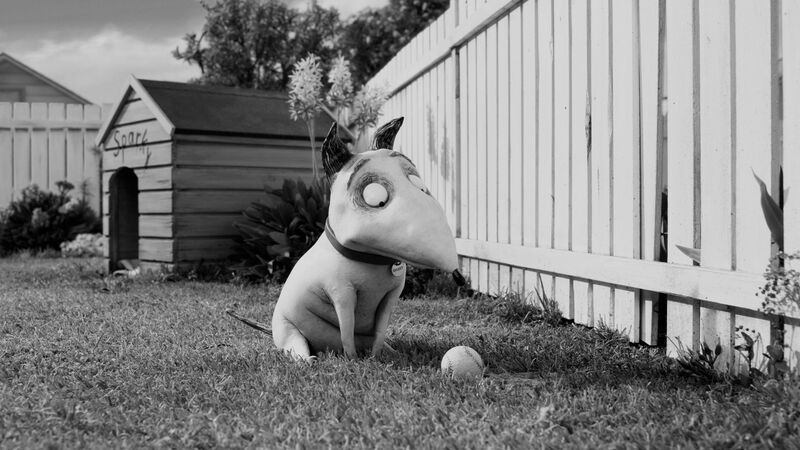 In Frankenweenie, what’s heartfelt is the simple love between a boy and his dog. Surprisingly, the movie doesn’t have enough Sparky. The movie is yet another tribute to the power of stop-motion animation in how it captures the “dogginess” of Sparky. It goes beyond tail-wagging and panting. It’s in the little details like showing the happiness in Sparky’s eyes, or the subtle body language that helps bring the character to life. I’m a sucker for adorable dogs, and even though he’s stitched together, Sparky is a lovable pooch, and it’s bizarre that the movie doesn’t know how often he should be in the story. The film’s greatest flaw is how scattershot it can be. The notion of “compromise” is set up as a major theme, but never pays off. The power and morality of science is also raised as an issue, and it’s a nice throwback to the hubris of the main character in Mary Shelley’s Frankenstein. Burton carries that out to a nice extent by showing how the rest of the children aren’t emotionally coming from the same place as Victor, and how their science is irresponsible as a result. But this doesn’t really work since their revered science teacher, Mr. Rzykruski (Martin Landau), is the one who set up the science fair project in the first place, so how can the children be to blame? Eventually, Frankenweenie reaches the point where Burton is reaching into Universal’s classic movie monsters for material. The movie doesn’t even have a clear setting since it looks like it takes place in the 1950s, but characters mention “computer simulations” and Pluto not being a planet. But none of that really hurts the movie because while it may not tie together in a neat little bow, it’s still incredibly fun. The kids in Victor’s class are delightfully strange, especially a weird girl (Catherine O’Hara) who finds omens in her cat’s poop. Mr. Rzykruski gives a speech on stupid people not understanding science, and I guarantee this speech will be attached to YouTube videos of people who dismiss evolution or global warming. There’s even a great, big monster mash. All of these elements are thrown together, but Burton keeps them all under control, and the movie feels cohesive as a result. 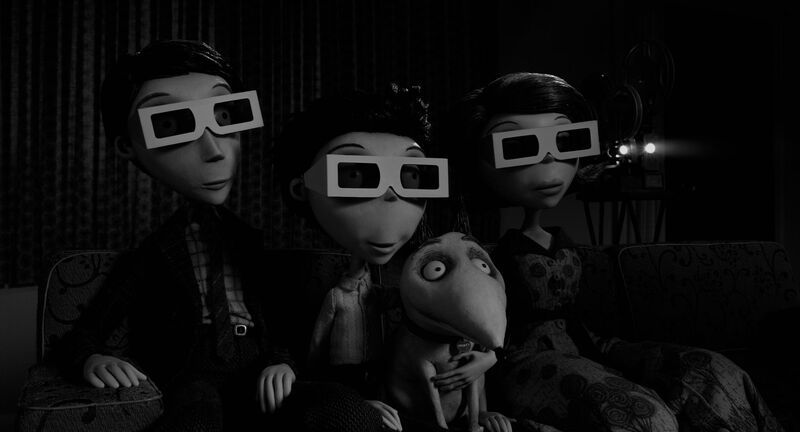 Frankenweenie isn’t his tightest picture, but it’s the first one in a while where the tone organically grows out the world, which in turn allows the movie to feel like its populated by genuine characters worth caring about. It’s an odd little town where subtexts don’t always play out, and the pacing can be a bit off, but it’s always somewhere we’re happy to be. 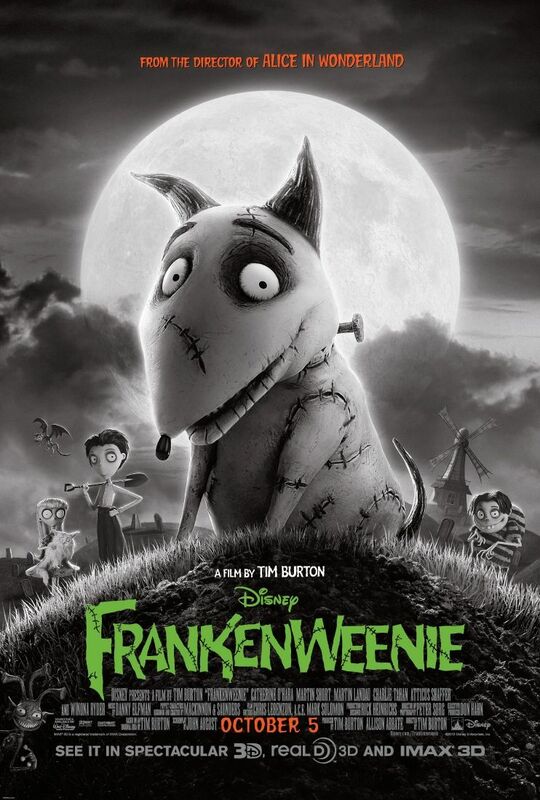 Frankenweenie plays a lot like Sparky after he’s come back from the dead. There are flies buzzing around his head, and they should be distracting, but Sparky just happily wags his tail, jumps up, and eats them.